For the Guzman family of Naperville, helping the poor and homeless of the western suburbs has been a way of life for decades. A passion for service has intertwined the family with the community of North Central College, where Dr. Richard Guzman has served on the faculty for the past 32 years. It has enveloped their church, Community Christian in Naperville, and inspired hundreds of volunteers ranging from students at NCC and Naperville North High School to congregation members from numerous churches. “I’ve worked with issues of homelessness for more than 30 years now,” says family patriarch Richard, professor of English at North Central. Wife Linda serves on the board of directors for Hear Us, a national organization devoted to serving homeless women and children. Through their church the Guzman’s have been involved for years with refugee resettlement, working with World Relief, an international organization that brings refugees from war-torn areas of the world to the United States. Richard’s son Rick, a North Central graduate, and Rick’s wife Desiree founded a not-for-profit organization to assist with refugee resettlement in 2002. Rick remembers a seed that was planted years ago when his father took him and his brothers to Aurora’s Hesed House homeless shelter. “When Hesed House was first founded, my dad took us to volunteer there, so it’s always been kind of cool to recognize my interest and awareness of homelessness from a very young age,” he said. Tragedy struck the Guzman family in December 2006, when youngest son Bryan, a 21-year-old student at North Central, drowned in Lake Michigan while walking his girlfriend’s dog along the Chicago lakefront. Rather than retreat in grief, the Guzman’s redoubled their efforts to serve the refugee community. When Bryan died, Rick was in law school at Northern Illinois University and Desiree was working as assistant director of ministry and service at North Central. Despite hectic schedules, their desire to honor Bryan’s spirit inspired them to purchase a five-unit brick apartment building on Aurora’s near West Side in 2007. After significant renovations, the apartment building would soon be transformed into a haven for refugee families. Naming the apartment complex in Bryan’s memory seemed like the right thing to do. “At the age of 21, he did genuinely have this spirit of wanting to give back,” said Rick, who received his law degree in 2009. He estimates that at many as 1000 individuals have been involved in Bryan House since its inception. The first families began moving into Bryan House in late 2008, coming from war-torn countries including Iraq, Eritrea, Democratic Republic of Congo, Kenya, Mauritania, Togo, Burundi and Bhutan. Each family’s story is unique, heart-rending and inspirational. Eight refugee families have moved through Bryan House into independent housing. A typical refugee family stays for a year to 18 months, saving their monthly rent and often qualifying for a matching grant of $4,000 from World Relief. This allows them to leave with savings of around $15,000 to $16,000, which is used to purchase a home or rent an apartment. For families with children, a portion of the money is set aside for a college savings program. “What we’re about is breaking that cycle of working class poverty through home ownership or through college scholarship to make sure that the next generation has better opportunities,” Rick said. Now the successful concept of Bryan House is expanding. Through the support of Community Christian Church’s non-profit organization, Community 4:12, Rick has been hired to launch The Emmanuel House Project. The project’s purpose is to replicate the Bryan House model to serve the Hispanic community on Aurora’s near East Side. Bryan’s middle name, Emmanuel, which translates as “God with us,” serves as inspiration. For 2011, The Emmanuel House Project has set an ambitious goal of opening three housing units that will put residents on a path toward home ownership. The model relies on matching a church sponsor with an individual housing unit, so the project is actively recruiting church involvement. 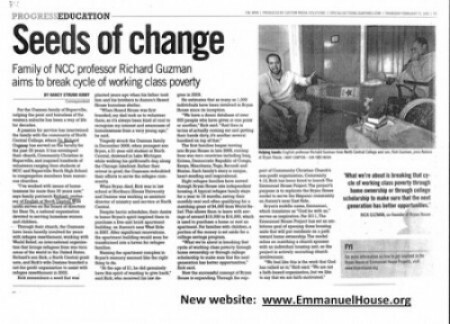 ♦ RETURN to the Emmanuel House / Bryan House main page. The article as it looked in the paper on Thursday, February 17, 2011. This entry was posted in Family, Social Change and tagged Bryan Guzman, Bryan House, college savings program, Commmnity Christian Church, Community 4:12, Desiree Guzman, Emmanuel House, Hesed House, home ownership, Homelessness, Linda Guzman, Nancy Strunk Kirby, North Central College, refugees, Richard Guzman, Rick Guzman, working class poverty, World Relief. Bookmark the permalink.